This article is about the holiday. 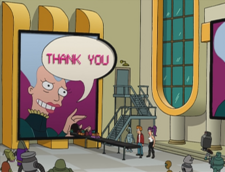 For the Futurama episode, see Mother's Day. Mothers Day is celebrated by robots on Earth to honor their creator Mom. Presents and cash are given similair to Mother's Day in the 20th century. Robots love the day so much that even Bender is willing to buy presents instead of stealing them. However Mom secretly recycles the presents (by crushing them into powder and she sold them as a hocus-pocus cure for cancer) and takes the cash. It is also the day Professor Farnsworth left Mom for the first time so she hates Mother's Day despite acting like she loves it. For the 3001 Mother's Day, Mom programed her robots to revolt and make her the Supreme Overlord of Earth. This page was last edited on 16 December 2010, at 21:38.